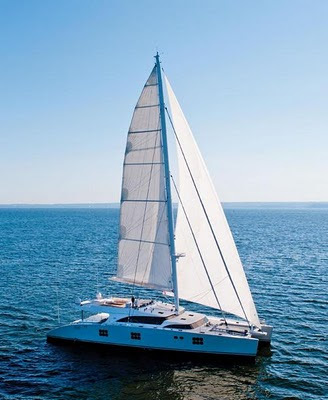 IPHARRA, Sunreef 102 is a luxury sailing catamaran which can comfortably accommodate a party of 12. She is large enough to easily offer guests a varied selection of activities. Spend the day sunbathing on the flybridge, or relax under the shady cockpit. In the evening, retire to pleasurable alfresco dining in the cockpit under a "starry sky" ceiling. Due to the wide, panoramic windows covering the entire forward section of the lower deck, guests are always able to admire the stunning sea surroundings. As the skies darken, take in the sunset and nighttime sky while laying on one of the spacious chaises in the aft. In the starboard bow, a high conference table/chart table with a display screen has been purpose-installed for meetings or video conferences. The saloon is decorated in soothing beige. It is the perfect place for entertainment in luxury, equipped with a multimedia entertainment system of the highest quality, including a 40" LCD television and Bose hi-fi audio system. Ideal surroundings for a movie or a laid-back chat while sipping a colorful drink served by the crew. The same sumptuousness extends to the cabins. The Owner's suite is furnished with a centrally positioned King-size bed and furniture made of wood ajouré, giving a light and delicate touch to the entire composition. A small fridge is smartly located by the bed for easy reaching for the last chilled drink of the evening. A comfortable mattress for two along the windows allows you to admire the horizon while relaxing inside. There are two double cabins along the portside hull: in the midships (featuring twin beds) and the bow (featuring bunk beds). These are beautifully illuminated by natural light coming from generous six-parted hull windows. The aft part of the portside hull features two VIP cabins with a double bed (convertible into two twins), one foldable Pullman bed, private bathroom, as well as six-parted hull windows for best luminosity. These are accessible directly from the main deck. To take full advantage of ideal charter vacations, the yacht has a complete set of diving equipment for 8 guests, a kayak and a wide selection of top-notch water toys.